According to ChemOrbis daily headline, economic growth forecasts for major European and Asian economies are being revised downward for 2015 in the wake of disappointing economic data for the second half of 2014. 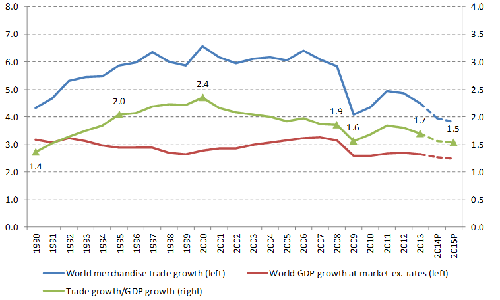 On Tuesday, the World Bank cut its global growth forecast for 2015 while lowering its growth estimate for 2014 in its twice-yearly Global Economic Prospects (GEP) report. The bank projected a growth rate of 3% for the global economy in 2015, down 0.4% from its June forecast but up from 2.6% in 2014. 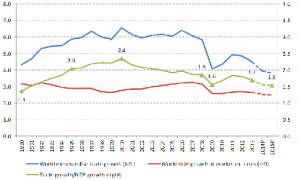 Its estimate for 2014 growth at 2.6% was attributed to negative growth outcomes in Europe, Japan, South America and Russia. According to the report, the global economy is projected to grow by 3.3% in 2016 and 3.2% in 2017. Reinforcing the bank’s expectations of weaker global growth, manufacturing in the Eurozone fell by a greater than estimated amount in December, data from Markit Economics revealed. Markit’s Manufacturing Purchasing Managers Index (PMI) increased to 50.6 in December compared with a reading of 50.1 in November after preliminary estimates called for a reading of 50.8 for December. Any reading above 50 indicates expansion. According to a preliminary purchasing managers’ index (PMI) compiled by Markit Economics, the UK’s manufacturing activity unexpectedly decreased to a three-month low in December due to weak growth in key overseas markets. Markit’s preliminary PMI declined to 52.5 from the reading of 53.3 reported in November, frustrating initial estimates which called for an increase. According to data released by the German Ministry of Economy, the country’s factory orders fell for the first time in three months in November. Factory orders decreased 2.4% on a seasonally and inflation adjusted basis in November when compared to an increase of 2.9% in October. On a yearly basis, the country’s factory orders contracted 0.4% when compared to the same period of 2013. Domestic factory orders slumped 4.7% in November while export orders were down 0.7%. According to a preliminary purchasing managers’ index (PMI) compiled by HSBC and Markit Economics, China’s manufacturing retreated to a seven month low in December. HSBC’s preliminary PMI decreased to a reading of 49.5 for December from a reading of 50 in October. China’s foreign trade fell below estimates this year. China’s Ministry of Commerce reported that the country’s foreign trade will expand 3.5% this year compared with initial estimates which called for a growth rate of 7.5%. In a move to offset weaker manufacturing growth, the Chinese government decided to accelerate infrastructure projects that cover seven industries and include oil and gas pipelines, health, clean energy, transportation and mining in order to support the economy. Singapore’s gross domestic product increased 2.8% in 2014 after an expansion of 3.9% in 2013, lagging behind economists’ estimates for a 3% increase. The country’s slower expansion was attributed to sluggish growth in other major global economies, especially China, Europe and Japan as Singapore’s economy is heavily dependent on exports. Elsewhere in the region, the World Bank lowered their 2015 growth forecast for Malaysia to 4.7% from the previously estimated 4.9%. In addition, the Bank of Korea (BOK) lowered its economic growth estimates for 2015 from 3.9% to 3.4%.